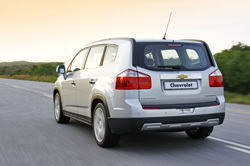 Just like the relaxed, smooth, effortless style and swing which earned South Africa’s tall golfer Ernie Els the nick name of The Big Easy, Chevrolet’s rather large people carrier does almost everything right in a relaxed, comfortable style. Not only does it have a cavernous cabin and generous load space, it also gallops along smoothly and quietly and is an impressively easy chunk of metal to drive and park, in spite of a kerbside weight of 1.5-tons. There are other seven-seaters on the market, but few offer the practicality, versatility and quick and easy seat configurations of this large new Chev at such a competitive price. I particularly like the theatre-style, raised tier format of the seating which gives second and third row passengers more space and panoramic forward and sideways views. Moreover, unlike others of this size, headroom is not compromised and passengers don’t feel cramped and hemmed in at the very back. The second and third rows of seats fold down independently to give the Orlando a capacity of 1499 litres and what’s more, even mummy and the teens can do it, it’s so easy. To fold the second row of seats flat requires just two clicks, a fold, and a forward tumble. Another two clicks and the two seats in the back are flat. It’s that simple – and it can easily be done in about three minutes. When it comes to family vehicles there is always a demand for storage space for any number of odds and ends that are a part of any family journey, be it a Mum’s taxi trip to school, rugby practice or the annual trip to Etosha and the Orlando caters well for this with plenty mousey-holes in various shapes and sizes, including map and cold drink bottle holders incorporated into the front and rear door side panels. However, the most ingenious of the storage areas I have ever seen in a vehicle is hidden behind the facia of the audio system which is accessed by flipping up the face of the audio system. Good place to keep a cell phone, wallet, sunglasses or an MP3 player hidden away from inquisitive eyes and thieving hands. Safety is a key consideration when it comes to choosing family transport and here the Orlando really shows it pedigree well with a reinforced passenger ‘safety cage’ of high-strength steel to protect the occupants in front, side-on and rear collisions. Further protection comes via six airbags and the vehicle is also equipped with a clever system which automatically releases the door locks when a heavy impact is detected. I drove the two new Orlando variants (with identical engines but different specifications and fancies) in the Eastern Cape region where the roads are far from perfect and I could hardly believe how quietly and smoothly the big beast galloped along. The cabin is well insulated against road, wine and engine noises (although the engine does sound a tad gruff when it is being whipped really hard) and the Orlando sits well on the road. On isolated stretches we cruised comfortably at speeds which would make any speed-trapping ticket writer smile with glee and the vehicle had no problem keeping up the pace, even along undulating stretches. However, we were only two up and sans luggage, so I cannot vouch for its willingness to trot up in Gauteng when saddled with four passengers and their week-away luggage, solids and thirst quenchers on board. Although fairly tall the Orlando doesn’t lean overly much in the twisties and even though we pushed along quite enthusiastically there was no noticeable intrusion from the electronic protection devices. On the tar the suspension is comfortable without being floppy or bouncy but it would also have been nice to see how this Big Easy behaves on gravel roads which were not included on our set route. One of the Orlando’s strong features is its brakes which work really well, without any hint of slew or bite. No stomping is required to bring it to a dead stop in seconds. Both variants, the LS and the LT, get their grunt via a five-speed manual transmission linked to a DOHV 16-valve engine that produces 104kW and176Nm. (There are no immediate plans for an automatic model or a diesel option). Chevrolet says its new wagon will use 7.2-litres/100km in the urban cycle while keeping emissions down to only about 171g/km. Top speed is given as 185km/h although I must say that the Orlando feels as though it has the legs to go a bit faster. A few fellow scribes felt the gearbox would benefit from an extra gear, but to me the five gear set-up worked well with the 1.8-litre mill. Both variants come with an extensive range of very attractive standard features such as a fully adjustable steering column, electric windows and mirrors (which also fold away and are heated), cruise control, tinted windshield, adjustable driver’s seat, rear park assist, cargo net cover, a full-size spare wheel, six speaker sound system with MP 3 compatibility, steering wheel controls and onboard computer. Driving aids are also plentiful and include ABS brakes with electronic brakeforce distribution (EBD), electronic stability programme (ESP), traction control, brake assist (BA), ISOFIX child seat fixtures, automatic locking doors, child locks on rear doors, anti-theft alarm and immobiliser. Manufacturers of these large vehicles often go a bit overboard when describing their particular SUV’s looks but in the end they really are all rather large boxes on wheels, not ugly, just not the kind of design that will win any major design awards. Having said that, the Orlando cleverly blends SUV visual elements with MPV functionality and the end result is hardly unattractive or dull, thanks to its striking dual-port grille adorned with the prominent Chevrolet golden bow-tie, handsomely chiselled bonnet, gleaming large alloys, acres of glass and a sweeping roof-line which tapers quite handsomely towards the rear of the vehicle. The big Chev carries a full-size spare wheel tucked in to the vehicle’s underpinnings below the luggage hold which is not ideal and not all that practical, but it is, I suppose, the price one pays for all that interior space. In looks and power the two variants are essentially the same and the differences are in the R40 600 purchase price of the snazzier LT variant and classier kit such as leather seats and trim, bigger 18-inch alloys, chrome door handles and a few other bits of glitter, which really only adds more brag status. Should you consider the fancier model do check the price of replacing an 18-inch tyre vs the 17-inch tyres of the LS model because bigger tyres often cost a lot more than 17-inchers. The price tags of the LS (R254 400) and the LT (R295 000) include a five-year/120 000km warranty and roadside assistance as well as a three-year/60 000km service plan. The golden bow tie brand is on a roll second to none having sold 2.35 million vehicles globally in the first six months of this year – the best half-year performance in Chevrolet’s 100-year history. With its wide appeal in terms of safety, practicality, ride comfort, space and long list of standard features the Orlando will undoubtedly be another booster to Chev’s growing popularity in our neck of the woods.